Does the yield curve really predict recession? One-Minute Summary We're writing this Wednesday mid-week so either something big will happen that will render all below irrelevant or it may have a two-day staying power. We had a week where the broad economic numbers were still weak: housing, trade and consumer confidence. Markets traded off but much of the news was anticipated so there were no grand meltdowns. 1. You're not going to talk inversion again, are you? Afraid so. So, let’s be clear. 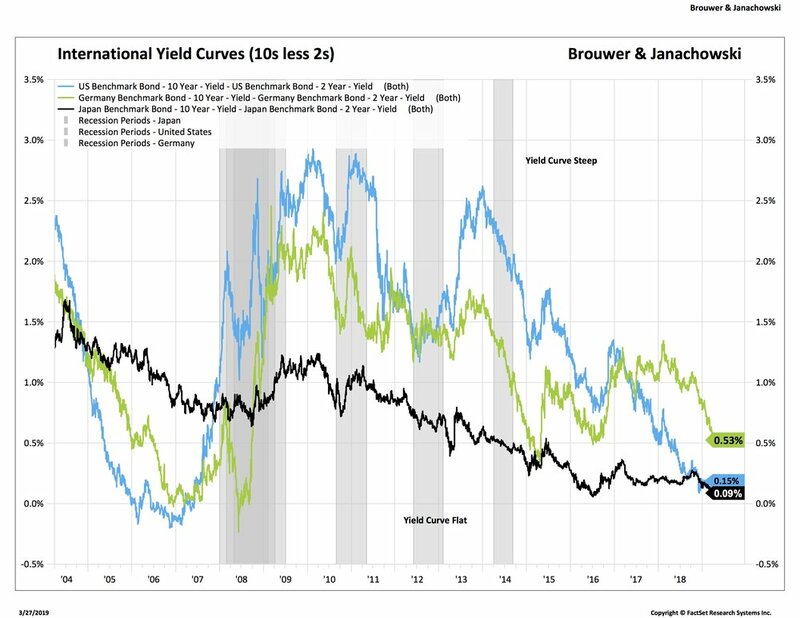 The yield curve has not inverted. Parts of the yield curve have inverted. The most cited curve is the 10-Year Treasury and 2-Year Treasury (or 2s/10s because bond types love shorthand) and that has not inverted. The 10-Year Treasury yields 2.37% and the 2-Year Treasury yields 2.25%. Next we go to the 2s/30s, so now we’re at the 30-Year Treasury, which yields 2.82%. So that's not inverted either. Where’s the inversion? In the belly of the curve, so-called because if you hold it vertically it looks like, well, a belly (here take a look, section 1, blue line). Ok, so where we have inversion is in the 90-day bill, yielding 2.45% and the 5-Year Treasury at 2.19%. And at the Fed Funds Rate of 2.5% and the 90-day bill. b) post-2008, banks must hold safe assets and the long Treasuries don't tend to be sold much. And that means? Now that's where the long knives come out. Some say “harbinger of recession, tin hat and New Zealand time” , others, meh. We're in the middle and take the view that a) tax cuts brought forward growth b) the tax cut effect has faded c) growth everywhere is slow and d) that the bond and stock markets saw this coming six months ago. So, will everyone please calm down. Yield curves in developed markets started to flatten a few months ago. All those lines sloping down measure the difference between 10-Year and 2-Year sovereign bonds in Germany, Japan and the U.S. The U.S. one is still above zero, just. The others are at their lowest levels in two years, although note that in the case of Germany and Japan all four bonds (so two at 10-Years and two at 2-years) are at negative rates. As we’ve noted before, a yield curve inversion does precede a recession but not all the time and even when it does, it can lead by 9 to 23 months. And, as we’ve also said, being early and right is the same as being wrong. Where does this lead us? That economies are weak, growth is slower and that any upturn, here or overseas looks far from certain. So with that we're fine with our Treasury allocation and focus on the front-end of the curve. The absolute level is around 220,000 and as a percent of the labor force, it's never been lower. So, we’ll change that “perhaps” for “no” and watch the claims numbers. The S&P 500 is still ahead, showing around 7% annual growth in earnings. Europe is the worst hit because of banks, which are not only badly managed but have bad loans and assets and low rates to contend with. Japan is suffering from trade problems and low growth. So, there is the earnings growth: weaker and probably due for some downgrades but probably priced in. Bottom Line: We're probably done with the low rates news and its immediate effects on the market. We'd like to see equities trade sideways but we don't always get what we want and would expect some correction unless earnings surprise to the upside. Treasuries seem like a continued good allocation.